NOTE: This chain will not fit through the bail on all of my pieces. PLEASE ask me through the "CONTACT US FORM" on the home page if you are considering this chain for a given item to confirm that we can fit the item on this chain. This is the next level up from the 2.5mm weight, and is in the heaviest chain in this series. This weight and diameter has a very substantial feel. This chain is generally worn by men, though women do purchase this heavier chain when a substantial look and durability are desired, generally for larger heavier items with larger chain bails (see above underlined note). The chain is an intergral part of the "setup with a pendant" in a visual sense, as does the 2.5mm also offered in this series. Please note that due to the way this chain is made, the thickness can vary slightly (generally between 3.2 and 3.5mm). 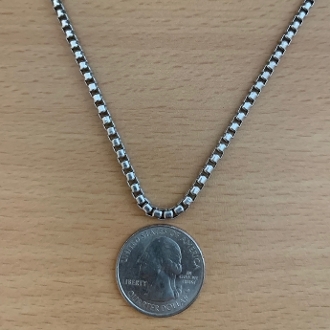 There are folks who like this chain as a standalone chain as well, and thus can be worn with or without a pendant when a more streamlined or solo chain style is desired. Description: These chains are one of my favorite additions to my line in offering great quality and pricing for solid sterling chains that go very well with my work and other sculptural antique pendants. The antique finish of this chain lends itself well to the darker contrast style of my work, blending with the pendants and not appearing bright or glaring, offering a more subtle "broken in" tone that is typical of all sterling chains over time. This finish type offers an instant match to the antiqued contrast of my designs and other antiqued pendants you may already own. 5) These chains are crafted in very many diameters and lengths, making this chain type a very flexible option for a wide variety of pendant types, sizes and structures, as well as the wide range of taste that folks have in chain weight and style. Please see the range of thickness options in the chain category to best match your desired pendant.